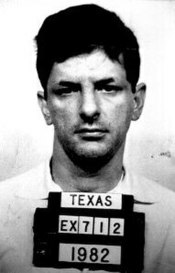 Stephen Peter Morin (February 19, 1951 – March 13, 1985) was an American serial killer executed by lethal injection by the state of Texas. His last victim, Margaret Palm, rode around with him in a car for 10 hours before taking him to a bus station and buying him a ticket to Austin. He let her go, boarded the bus and surrendered himself to authorities without resistance. Morin withdrew all appeals after pleading guilty to the 1981 capital murder of Carrie Marie Scott. Morin was later convicted of the killings of Janna Bruce in Corpus Christi, Texas, Cheryl Ann Daniel in Las Vegas, Nevada, and Sheila Whalen in Golden, Colorado. Morin said he never intended to kill Scott and pleaded with her to leave him alone but then he said something came over him and the gun went off. However, the evidence at trial showed he shot her in the parking lot of Maggie's Restaurant while she was trying to escape being abducted by him. Because of Morin's history of drug abuse, the execution technicians were forced to probe both of Morin's arms and one of his legs with needles for nearly 45 minutes before they found a suitable vein. Morin was pronounced dead at 12:55 a.m. on March 13, 1985 by lethal injection, becoming the sixth man to be executed by lethal injection, in Texas since the state began using lethal injections in 1982. He was a suspect in over 30 unsolved violent crimes across the country. Obsession: Dark Desires: "Paging Sarah"
^ a b "Jury being picked for trial of suspected serial killer". The Deseret News. Associated Press. July 11, 1984. Retrieved 3 April 2014. ^ "Stephen Peter Morin, a Christian convert three times condemned..." UPI. Retrieved 2017-01-28. ^ "MURDERER OF THREE WOMEN IS EXECUTED IN TEXAS". The New York Times. Associated Press. March 14, 1985. Retrieved 3 April 2014. ^ "TEXAS EXECUTES DRIFTER WHO KILLED THREE WOMEN". The New York Times. United Press International. March 13, 1985. Retrieved 3 April 2014. ^ Clarke, Chris (April 14, 2005). "Stephen Morin: How I unwittingly helped a serial killer". The Guardian. Retrieved 3 April 2014. Final Meal Requests at the Wayback Machine (archived December 2, 2003). Texas Department of Criminal Justice (2003-09-12). Archived from the original on 2003-12-02. Retrieved on 2007-08-17. This page was last edited on 5 April 2019, at 05:11 (UTC).